Summary: Emeco Holdings is currently selling for less than its liquidation value. Although the industry is in a cyclical downturn, Emeco continues to generate free cash flow and is well within its debt covenants. I think it is worth around book value of A$0.72, compared to its current share price of A$0.22. Emeco leases heavy earth movement vehicles to the mining sector. The business model is to buy equipment, funded with debt and equity, then lease it out as much as you can and make money. I first came across the company on the Red Corner and decided to check it out. After reading about the company I was quite enthusiastic, they have very stable positive cash flow throughout the economic cycle. Because most expenses are up front costs of equipment, when the industry is in a downturn they simply stop buying new assets and even sell off assets, and operations always generate cash. This is great for an investor as it means that the company can carry a lot of debt without many of the risks usually associated with it. After looking at Emeco’s earnings however, compared to debt, my interest started to wane. After paying off the debt there would be little left over for shareholders. But I thought harder about the business and what it is actually doing. It has a lot of equipment on the balance sheet, which the debt is used to purchase. So as long as it has the equipment, does it actually make sense to discount future earnings by its debt? If those assets can be sold when needed to pay off the debt, then actually that earnings stream can be taken out of the business by the owners. Take a look at the financial history below. You can see debt is ever increasing while earnings have been erratic due mainly to economic conditions. I’m not as convinced as Red is about depreciation being double maintenance capital expenditure. The 2013 results are out now which show that in fact depreciation is lower than maintenance cap ex so to be conservative I think depreciation is a good proxy. 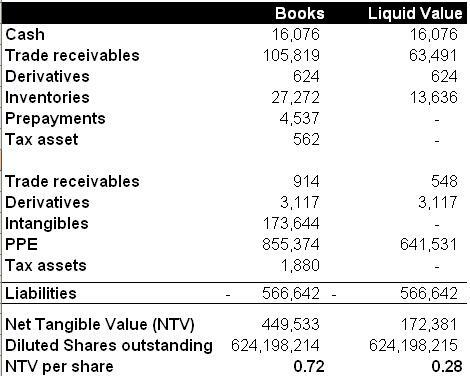 Given the table above I think the business is probably worth about tangible book value although I note that they have had plenty of impairments of assets that have damaged it over the years. To be more conservative I have done a rough calculation of the liquidation value of Emeco. The most important thing here is property, plant and equipment. I have assumed it can be sold for 75% of what it is carried for on the books, but even a small change in that assumption can drastically change the valuation. Is it reasonable? Well I think so, in the 2011 and 2012 the company sold equipment for a net profit. Still, $0.28 is a lot lower than Emeco’s current $0.72 tangible book value per share, and, importantly, is above its current share price of $0.22. The industry is really struggling at the moment, but it happens to all cyclicals. Just a couple of years ago Emeco was trading for $1.20, well above book value. I don’t see why favourable conditions won’t return again to the industry but who knows when it will be. For now I can sleep well in the knowledge even if it liquidates I’ll still probably get my money back. One thing does worry me though, trade receivables have been increasing rapidly, even as sales fall, which means lots of invoices are overdue. I expect write-offs will be needed as customers fail to pay. The equipment is classified as fixed assets but, of course, it is simple inventory. As such the business doesn’t have to liquidate, it can just sell of its inventory. Earth movers are transportable to other parts of the world and have uses other than mining. Easy enough to check the selling prices of used CAT equipment in, say, the United States. Agreed, I don’t see a real possibility of it liquidating given the stable cash flow, as you say it can just downsize. The liquidation value just highlights the deep undervaluation.